Online Form Filling Jobs is the way to reduce office load and sped up on customer/client work process. Almost 1 billion form needs to fill each day on all over the world. The worlds are now ready to build for digitalization. Most of the office works are now ready to be outsourced through the internet. In India, 13 Lakh Company and some of the government agency now outsourcing their form filling works through the internet. Security deposit: 00.00 (Yep! All is FREE here) No Hidden Charges. Rate / form : Rs. 8.00/form Entry. Billing:4 – 5 days after QC report. Live Chat from Member area. Payment is Secure and Trusted by AMT Guarantee Policy. Please note that form filling jobs does not come with a particular form and data. As per company data processing, the form and data for form processing may be different. It’s like a different company has the different form to process. Some of from are 3-6 files and some of from maybe 10 – 35 files. So the payment will depend on the volume of data conversation. It’s quite very simple, only you have to login into Cyber Expo member area and click on dashboard. There will be blank form and data option. Just open a blank form and copy data into that form after completing data pasting you can make a quick review whether fields are missing or not. If you missed anything then process to correction and submit to CYBER EXPO Service. After submitting it takes 1 or 2 days to validation of works. CYBER EXPO team check your works and approved your total form as per your work accuracy and quality. Can I See Demo Form Filling Jobs in CYBER EXPO? We have one demo account for you. You can log in there and work with 3 form for work testing purpose. Please note no payment will be done for working on a demo account. Try Demo member Area from here. We have some demo work video presentation for you; from below you can check those out. Additionally, you can ask for live work demonstration from our customer care support team from here. Why Form Filling Jobs: Home Work Before Get Started! It’s a non-technical and easy job. Work with slow internet connecting also. No need to data typing, Just use copy paste to data movement from one browser to another. Excellent payment, with daily credit into your register bank account. Free Customer care support, live chat support, and email support. No Targets or goal to archive. Work simplify, payment simplify. International works can do the works. Basic Requirement for Form Filling Jobs? Hardware requirement: Minimum Pentium System with Good Internet connection. Skills: Basic windows operating knowledge, Email and Internet processing. Education and Age: Any Computer literacy has the eligibility for form filling work. Document Requirement: One Passport size photo, one address proof, one photo ID proof. Or you can apply for CHEQUE payment. Daily and weekly payment plan are not allowed to choose Cheque payment, bank transfer is the same method of Daily and weekly payment plan. PayPal: All International freelancer can be transferred their payment in USD as per their Plan via PayPal, Paypal payment not allowed low India,Bangladesh, Nepal. Money Booker: only Nepal and Bangladesh workers will be paid by Money Booker, But it’s Depending on Reserve bank Act – if Reserved bank have any restriction they money cannot be transferred via Money Booker. How to Sing Up in Form Filling Jobs? Step 2: Now Understand the Plan and Pricing, We have different Form Filling Jobs Plan – like Daily payment, weekly payment, and Monthly Payment, It’s better to choose the daily payment plan as it the most popular plan from CYBER EXPO. Hence you can check the plan details from here. Step 3: Okay, Plan and pricing are clear now it’s time to register for a Form Filling Jobs Plan Click here to Begin the Registration Process. Step 4: Now make the payment according to your plan and send your photo ID proof, address proof along with Payment proof that you have made before. Its take 30 minutes or less to activate your account. Why CYBER EXPO Best for Form Filling Jobs? CYBER EXPO Deference that other online or offline form filling jobs. We are granted our payment by offer Indian Government Court Paper to our every member of form filling works. ISO Certified with 5 years plus business experience in Internet Jobs or Online Jobs. Why Court Paper Agreement in Form Filling Jobs! Agreement Paper with two Party Signatures. Agreement Paper will be Bracketed with Your work validity, your Monthly Earning and Your Registration Details, Its Give you 100% Safety form any Fraud Activity. 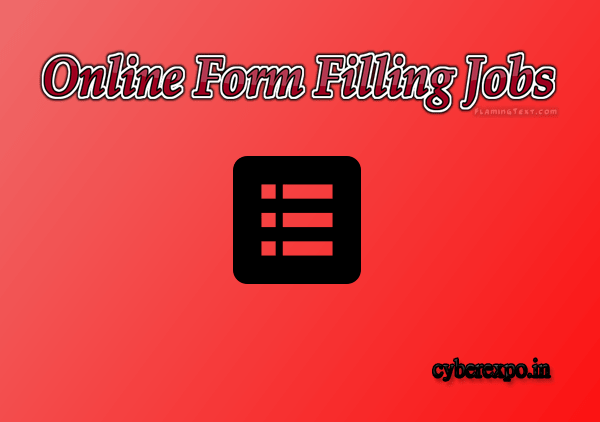 How to Get paid By Doing Online Form Filling Jobs? Register for online form filling Jobs. Start your works → Finish your works. Wait for payment as per your plan for getting paid. Its take 1- 2 days to check your works and transfer your payable amount to your register bank account. Form Filling Software is it Helpful? There are lots of online form filling software available in the markets. Hence CYBER EXPO offer FREE Form Processing software and 2 Free Software for offline form filling jobs. Additionally, any non-CYBER EXPO works can purchase online /offline form filling software from here. Can I do online form filling jobs from home? As its online works, so work freedom is available for you. No matter where you are placed you can start your computer and Login to your account to start online form filling jobs. Even you can do online form filling jobs from home as well as from your office. Please read careful CYBER EXPO Term of service and acceptable user police before registration for any form filling jobs here. You are registering means you are agreed to our Term of service and acceptable user policy.